Copper and Brass Etching always works best when it is fresh. The more you use it, the slower and shallower it will etch. A fresh batch of etching will give you a much better end product. In order to keep it fresher for longer, be sure to keep it covered when not in use. Now let’s look at a step by step demo just for you! Be sure to rub your metal with scotch brite or steel wool. The reason for this is that the resist sticks better to clean metal with a slightly rough surface. 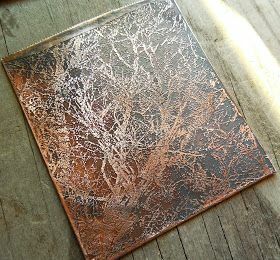 Start off by painting a thin layer of resist (Lacquer or varnish) over the back of the copper. When it has dried up, cover it up with some masking tape. You can use an old brush of any sort in order to spread the resist evenly and use some rubbing alcohol to clean it up. 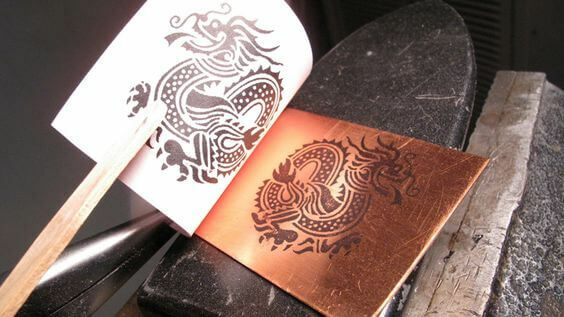 Using a permanent marker pen as your resist, draw the design onto the metal. Sometimes multiple layers help build a better resistance. Fix any errors with an earbud and rubbing alcohol. Let it dry for 15 minutes and then it is ready to go into the etching bath. It is now time to pour your etching solution into a plastic tub. It is best to use a large plastic container with a lid in order to store the leftover solution. 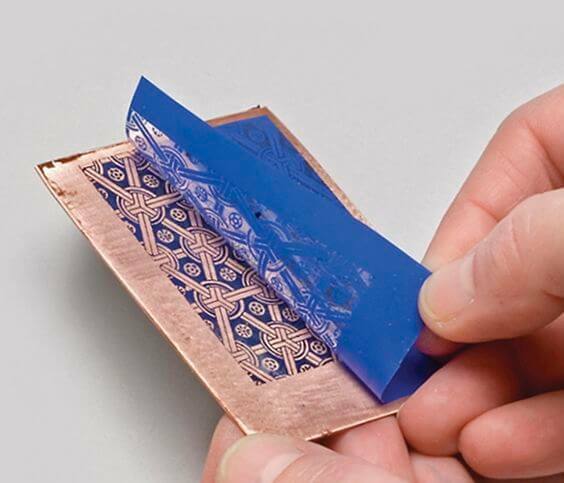 When using copper etching, the metal needs to be suspended design side down into the etching solution. In order to do this, place a long strip of tape across the back of the piece then place it in the tub just below the surface with the ends of the tape attached to both sides of the tub. Depending on your personal preference for how deep the etch should be, it can take anywhere from half an hour to 4 hours. Just remember to check up on it every now and then. Once you have a deep enough etch, remove it from the tub and rinse it off in a sink. Use a cotton ball and saturate it with rubbing alcohol and rub off the resist. And then last, but not least, scrub the Metal with some soap and scotch brite. These are just a few examples of what to do, so you can really get creative and have beautiful gifts for either yourself or loved ones.